The beauty and muchness of Ai Weiwei’s art is often underwhelming. 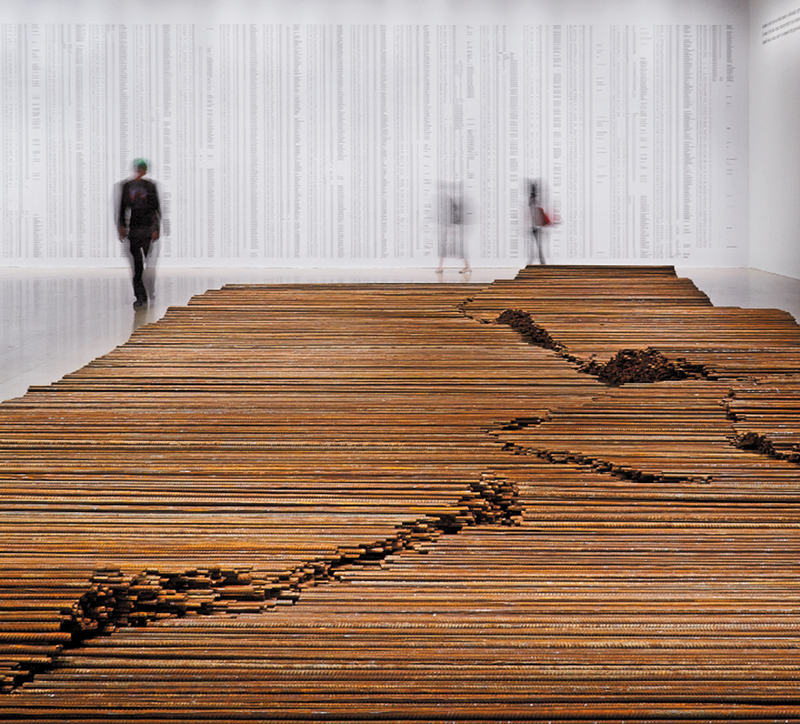 Ai Weiwei’s sculpture Wenchuan Steel Rebar (2008–12), has a bluntly descriptive title and a restrained lyrical form, and includes an allusion that places the viewer at a remove from both. The work amounts to a polemic against appearances. I encountered it in the traveling exhibition “Ai Weiwei: According to What?”, which recently closed at the Art Gallery of Ontario in Toronto. (It is about to open at the Pérez Art Museum in Miami, December 4–March 16, and will conclude its tour at the Brooklyn Museum, April 18–August 10.) What I saw was a mass of rebar—the steel rods used to reinforce concrete and masonry—gathered into a perfect rectangle of about twenty by forty feet, amounting to some forty tons of metal. The thousands upon thousands of rods are as rigid as the specs that any construction project would require, but they don’t look entirely new. They bear a patina of use. Varying in length, they’ve been heaped together in such a way that they form a carpet of rusty metal, gently rising and falling in wavelike patterns that are, at most, about a foot high. This lightly undulating form lends the sculpture a lyricism at odds with the muted material in which that form has been embodied. they all remained buried in the rubble. Ai was not in Wenchuan when the earthquake occurred; the southwestern provinces are not his part of China at all. But it changed his life as an artist. For a decade, art from China had been a growing subject of fascination for Western curators and collectors—a trend that became broadly visible when the celebrated Swiss curator Harald Szeemann selected a significant number of artists from China, Ai among them, for his 1999 Venice Biennale. By 2008, when the “Bird’s Nest,” the Beijing National Stadium for that year’s Olympics, was unveiled, Ai, who had collaborated with the Swiss architects Jacques Herzog and Pierre de Meuron on its design, was the country’s best-known artist internationally. He was also a wild card, proclaiming that “an artwork unable to make people feel uncomfortable or to feel different is not one worth creating.” One notorious early work bore the self-explanatory title Dropping a Han Dynasty Urn (1995)—2,000 years of history smashed to bits. The same year, he began a series of photographs called Study of Perspective, each of which shows his outstretched arm and an extended middle finger before such monuments as the Eiffel Tower, the White House and Tiananmen Square. The uneasy accommodation came to an abrupt end when Ai threw himself into the “citizen’s investigation” of what had happened in Sichuan. Soon, his blog was shut down. Later, he was beaten by police officers while attempting to testify on behalf of a fellow investigator who had been charged with defaming the Communist Party; the beating was so severe that Ai had to undergo emergency brain surgery in Germany. In April 2011, he was arrested, ostensibly for “financial crimes,” and held for nearly three months; he discusses his imprisonment in detail in the lengthy interview at the heart of the recently published Hanging Man: The Arrest of Ai Weiwei, by the British journalist Barnaby Martin (Faber and Faber; $27). It’s hard to imagine the situation of a man being held incommunicado, in fear for his life, endlessly browbeaten by interrogators demanding that he justify his art to them. “The accusations are ridiculous and it is much more frightening because you’ve been thrown into the hands of people who will never understand what you are trying to say. I cannot explain to them about what I do. And on the other side, they are also very frustrated. They don’t know anything about art and they have never even touched political crimes before. I said, ‘Please, get on the internet to see how people discuss my art.’” If nothing else, Martin’s book convinced me of the unseemliness of the longstanding fashion among art critics of talking about “interrogating” works of art or artworks “interrogating” their subject matter. Why model criticism on the cross-examinations meted out to political prisoners? Dropping that pretension might even sharpen our critical judgment. If Ai’s prison guards ever took his suggestion and looked him up on the Internet, they might have found an eighteen-minute video that was shown in Toronto and can be found on YouTube. In it, Ai explains that Wenchuan Steel Rebar was produced by taking twisted rebar salvaged from the earthquake wreckage and having it hammered back, little by little, into straightened rods. (According to the video, the work’s title is, simply, Straight.) I can’t help thinking of Immanuel Kant’s famous adage: “Out of the crooked timber of humanity, nothing entirely straight can ever be made.” Needless to say, steel has greater plasticity than timber, and if the sculpture is a vision of how lives twisted by history can somehow be healed, that only goes to show Ai’s incessant optimism. Or perhaps the work is about memory and forgetting—with the way the steel holds its new form and forgets the catastrophe that deformed it, though we humans remember. At the same time, the piece is about the relation between sculptural work and the Duchampian ready-made. With art that conceals art, a lot of labor is expended in order to create a quantity of material that looks like it just came from the warehouse—“returned to a near-mint condition,” as Ai says in the video. Forge (2008–12), which is not included in “According to What?” but was exhibited at the Mary Boone Gallery in New York in late 2012, takes the same formal approach as Wenchuan Steel Rebar but from the opposite direction: It was made from new rebar carefully hand-sculpted to reproduce the misshapen pieces found amid the debris in Wenchuan. Despite the two works being complementary, why do I find Wenchuan Steel Rebar—or rather, despite the label in Toronto, Straight, which is more fitting—to be more moving? Maybe it represents an unexamined inclination of my own toward reticence over pathos—for the wounded person concealing pain over the person who exhibits more pain than what is felt to dramatize a point. It’s a preference, one might say, for minimalism over expressionism. Or maybe my response concerns the way the elements that compose Forge are scattered across the floor in a manner that strikes me as arty and arbitrary, whereas those in Straight are presented in a manner that seems straightforward and natural, despite the evident care that has been taken to create a perfect rectangle on the floor and lend a lambent rhythm to the crests and valleys of the field of bars. Which brings me to why I am of two minds about Ai as an artist, despite my admiration of his work as a valiant activist and even of his ability to create works like Straight. For every piece as finely judged as that, he’s made as many or more that are out of tune with themselves, works in which aesthetic missteps trip him up. “That’s irrelevant!” is what he would probably say if he heard my objections. “I don’t see art as a highly aesthetic practice,” he told the Hirshhorn Museum’s chief curator, Kerry Brougher. But it’s dangerous for an artist to be so cavalier about aesthetics. Most of Ai’s works are quite beautiful, or at least highly finished, but their beauty often seems a mere quotation of a beauty seen in another work of art. This wink should not be mistaken for a challenge of existing conventions of beauty. By exhibiting a field of twisted-up rebar, Ai is undoubtedly trying to challenge the viewer’s sense of art. And yet as anti-art the work is pat and mundane, as if Ai had been mimicking not the force of the terrible energy of an earthquake on flimsy building materials, but the routine pictorial gestures of the meandering brushstrokes of a second-rate Abstract Expressionist painting and immortalizing them in metal. As so often with artists, even the story Ai tells against himself, the story in which he gets his comeuppance, redounds to his favor: he started out with great chops, the envy of his peers—and then immediately got the point that art is so much more than technique. But I have to wonder if he ever took Scully’s point to heart. He hasn’t abandoned conventional skills so much as farmed them out to his employees. Ai sees himself as a conceptual artist, an heir of Marcel Duchamp (and of Duchamp’s American disciple Jasper Johns, from one of whose paintings the title “According to What?” is borrowed). But too often—and he is far from the only one of whom this is true—the conceptual artist seems more like an art director, because the underlying idea is overwhelmed by its high-finish realization. cylindrical horizontal sculpture made of gorgeous wood salvaged from the pillars of old temples and assembled, we are told, by “using traditional Chinese joinery techniques.” Through the center of this artificial log runs a cavity whose contours are those of the map of China. The exhibition catalog helpfully spells out the work’s intended meaning: “that the present Chinese nation has been put together from a variety of cultural and historical elements.” Usually I roll my eyes at such bromides, wondering why it is thought necessary to oversimplify artists’ ideas in this manner, but in this case I have to admit that Ai’s notion might have been just that banal. If you were looking for a nation of which it wasn’t true, you’d probably have to find a mighty small country—the Republic of San Marino maybe? Compare the wall text with the biting sarcasm of Ai’s blog posts about rebellions in Guizhou province, in China’s southwest, as well as in Tibet: “Today’s harmonious society was not easy to come by. As long as we follow in the firm leadership of the Communist Party of China, any unlawful attempts to fragment the motherland…will ultimately come to a bad end.” He is all too familiar with the imperial nature of the “joinery” through which his country, like our own, has been cobbled together, but whatever his intention, the beautiful piece of useless furniture that is China Log is meant to make it all worthwhile. Here, aesthetics—in the sense of beautiful appearance—trumps concept, to the work’s detriment. As with its finish, scale and quantity too often trump concept in Ai’s work. The most obvious example is probably his most famous piece, the installation of 100 million porcelain sunflower seeds at the Tate Modern in 2010–11. This is surely another of Ai’s representations of China, not by way of its map but as a metaphor for its vast population. But the same meaning would have been communicated by one-hundredth or even one-thousandth of the seeds; there is something self-defeating about a work that seems also to be a bid for a kind of Guinness Book of World Records notoriety—the artwork with more individual elements than any other in world history—but that ends up presenting a vast prospect of dreary sameness. Nothing in “According to What?” has been made on that scale, but Ai is always willing to try to overwhelm the viewer with manyness. There’s He Xie (2010), an installation of 3,200 porcelain crabs, or the innumerable ink-jet prints of Ai’s snapshots with which a wall is papered to make his Provisional Landscapes (2002–08). Ai also dabbles in muchness: how much tea had to be used to make the nearly six-foot-tall sculpture Teahouse (2009), which is—yes—a basic geometrical house form made entirely from bricks of delicious-smelling tea? Somehow I often remain underwhelmed. The book Hanging Man takes its title from one of Ai’s earliest works, a 1983 sculpture made from a clothes hanger bent into the shape of Marcel Duchamp’s profile. Ai’s insistence that he is a Duchampian artist may be misleading. An essential characteristic of Duchamp’s ready-made is being visually unimpressive, which is precisely what makes it into a tool for thinking about the nature of art. Duchamp liked to emphasize that in choosing his objects, “This choice was based on a reaction of visual indifference with at the same time a total absence of good or bad taste—in fact a complete anesthesia.” As the critic Boris Groys recently explained, Duchamp “wanted to reduce all levels of expressivity and introduce into the valorized cultural context an object that, situated as it was outside the artistic tradition, did not belong to the complex system of cultural associations, meanings and references. This strategy typified the classic avant-garde approach, which preferred to make use of non-traditional, profane, ‘insignificant’ objects to get rid of the ballast of traditional cultural symbolism.” For Duchamp, the ready-made was thus a kind of abstraction. To this academic formula, Ai has succeeded in adding something specifically Chinese—or so it seems if one accepts the view of Victor Segalen, the French writer and pioneering Sinologist, who declared that Chinese sculpture shares four key features: “It is monumental, it is funerary (but profane), it is imperial, and it is historical.” The imperial part comes with a twist, for Ai is a scathing critic of the empire under which he lives—and yet his viewpoint is not that of an individual at odds with the mainstream. Instead, he sees himself as a spokesman for the whole. Maybe that’s why he needs to make works that are vast—not simply to symbolize the vastness and multiplicity that is China but to establish an overview on it, albeit an opposition overview; it’s still one from which random differences among the millions of individual sunflower seeds are neither very perceptible nor very significant.